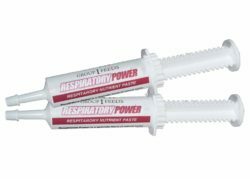 Respiratory Power is a specialty blend of natural herbs and extracts designed to aid in energy production while providing antioxidant properties. The paste harnesses the powerful properties of ginseng and grapeseed extract. Packed full of proanthocyanidins, which are a type of flavonoid. Acts as a powerful antioxidant, which aids in the prevention of tissue oxidation. Shift metabolism to favour fat utilisation over carbohydrate energy. Delays the build-up of lactic acid to increase stamina and reduce muscle fatigue. Immune-stimulatory properties provide assistance in fighting pathogens associated with being in competition settings.